Here in Edmonton we have seen a fair bit of snow the last 2 nights upto 20+cm and been cold didnt get above -18c today. Looks set too warm up in the south of the province but never really making it here..a bit like this week..when on wednesday it reached +9c in Calgary but never got above -14c here..and we are only 170 miles north of Calgary. Looking ahead to chrimbo looks like staying cold or very cold right throughout with some more snowfall. Very mild in southern B.C., we hit 12 C last hour on the coast here. Chinook warming in southern Alberta just south of Calgary to the U.S. border, will raise temps there to 8-10 C overnight. But the frontal boundary remains locked in around Calgary to Swift Current SK southeast into North Dakota, anything north and east of that will stay cold. Heavy snow past 24 hours in parts of the U.S. Midwest, rain on the east coast and into eastern Great Lakes, southern Quebec and New England. This storm is pushing northeast and is basically going to slam into the Greenland high and force it to part with all its lovely cold air. So we are doing our bit. I think this radar will update so if you read this days or weeks later, you'll see whatever's current, but today (Tuesday 14th locally) has seen 50-100 cms of snow on top of about a similar amount that fell last week there. Just west of the city of London (pop. 300,000) Highway 402 was shut down with hundreds of vehicles stranded and armed forces as well as civilians on snowmobiles had to rescue hundreds of stranded travellers. Good times ... meanwhile, it's raining and 6 C in Vancouver here. I lived in London Ontario for a short while in 2008 not in the winter though..many saying its the worst and heaviest snow seen in sw ontario for decades! I do not normally read this thread but I certainly shall in future-the videos posted are great and the live scenes from Canmore are very enjoyable-thanks Canadian Coops. Location: LANCS. 12 miles NE of Preston at the SW corner of the Bowland Fells. 550ft, 170m approx. Interesting N American scenes on Channel 4 TV news this evening. Only short clip alas but showed incredible ice sheathed buildings in Cleveland Ohio. One a lighthouse I think, thickly shrouded in wave spray turned to ice.. Would be worth another look on Channel 4OD. Found a link about the ice nr Cleveland Ohio. Any one want any lodgers in the Minnesota/Manitoba Area? haha but i seriously want to move to either one prefferably Minnesota in the Minneapolis/St. Cloud area! After university I might look into it! Whats it like to be in an ice storm? does it sound like rain? does it hurt if it hits you? Im gonna email my friend who moved from Thunderbay to London, ON see how it is there! It was mentioned on the news tonight-in some areas it was the first christmas day blizzard in 88 years and it is now forecast to track up the east coast. Yes, these are of course two different storms. The one today is tracking up the east coast and is currently just east of Atlantic City NJ heading towards Cape Cod. New York City could get 18 inches of snow from this and Boston could get two feet, all with strong winds too. The New Years storm will track further north, it is basically the same system as the one giving me rain here today, but coming from a point further south in the trough, moving towards the central Great Lakes. If this one moves as forecast, the east coast will get back to milder weather melting all this snow after a few cold, dry days in between, and snow will fall on New Years in the northern plains and upper Great Lakes (including parts of Manitoba too). We have had a very mild, green Christmas with highs near 10 C and a lot of rain up to about 1200m, so that ski conditions in the lower alpine resots have turned poor, still good at Whistler-Blackcomb and higher resorts. The Geostationary Operational Environmental Satellite called GOES-11 captured an image of the famous "Pineapple Express" at 1800 UTC (1 p.m. EST) on December, 19, 2010. Occasionally in the winter, a large jet stream forms across the mid-Pacific, carrying a continuous flow of moisture from the vicinity of Hawaii to California, bringing heavy rain and snow to the Sierra-Nevada for several days. This flow has been dubbed "The Pineapple Express." GOES satellites are managed by NOAA and images and animations from the GOES satellites are created by the NASA GOES Project at NASA's Goddard Space Flight Center, Greenbelt, Md. very mild in edmonton today we are at +3c which is some 13c above normal..looks to be temporary as the cold will be back and could be down to -30c by saturday. Looks like there is a chance for another snow storm for the NE states, esp Eastern part of the region from the system currently over Texas/LA region which is giving a mixture of precip types. I wouldn't be surprised if there is some 12-15 inches reports from this not that far from the New York area, maybe over Long Island? I'll be watching this area for now since the UK weather looks a little bland in the near future. 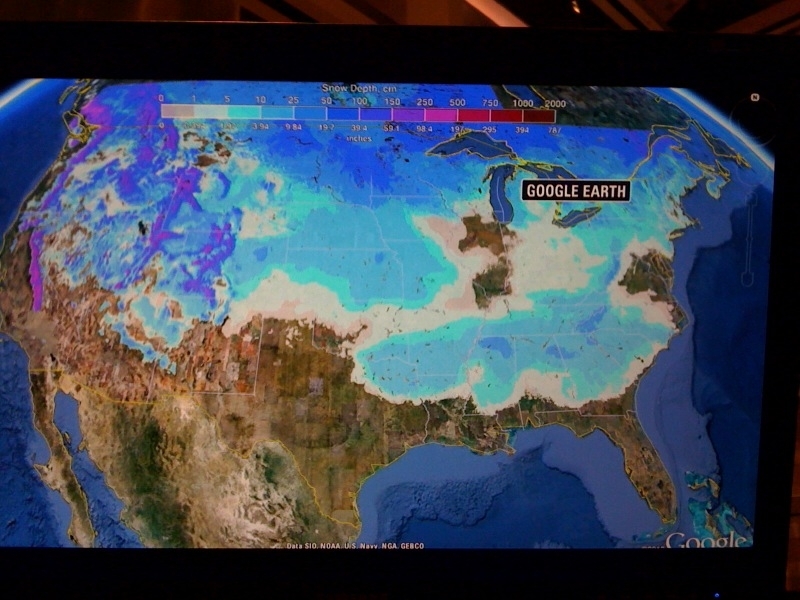 Every state in mainland US bar one (Florida) have snow..!! Not surprising given the temps. The midday synoptic chart. i had close to 40cm of snow sat/sun which is a near record snowfall for this time of the year..another storm due to arrive on weds into thurs with another 20cm predicted and temps as low as -35c..currently its -22c with a few flurries around. We have that second snowstorm now on the coast, just started at about 01z and already 3 cms at 05z, expecting 15 cms by morning, change to sleet or rain for a while, then perhaps a second round of snow. As cold as this air mass may seem, there's an even colder batch coming south from the western arctic, 490 dm thickness over Alberta by the weekend. Potential for -40 C when it clears. East coast storm meanwhile looks like about 30 cms for NYC and 35 cms for Boston, not a huge storm but fairly major, winds about 30-40 mph at peak. Disruptive, but probably not as bad as the Dec 26-27 storm was. Plenty of snow now in the Great Lakes region too, from several weak systems in the past week and locally enhanced amounts. Looks like alot of values between 8-12 inches being reported near New York with a little more further NE east with a bullseye probably near 18 inches. Here is the Times Square webcam, very interesting to watch! This storm has satisfied the "Meteorological Bomb" criteria of a pressure drop of 24mb in 24 hours. Only its done this in half that time!! What's also interesting is that the current blizzard bomb off New England is the product of two low pressures merging; one that crossed east from the central Plains up the Ohio Valley towards the NE yesterday, the other low moving NE up the eastern seaboard yesterday.